I don’t think I tasted a parsnip until I was well into adulthood. This is not to say I would have tasted them (or liked them) had I been served some when I was a child (as I have mentioned many times, I was an extremely picky eater). For some reason they just never crossed my path. I think that many Americans would tell a similar story…and that almost as many American adults would say they had still not tasted them. Even if I didn’t know of this lack of exposure from my cooking classes, the sad, wax-covered (an attempt to preserve moisture for an overly long stay in the produce aisle) parsnips available in many grocery stores would tell the tale. But, if the reaction of the people who have attended my classes is any indication, most people will like them when given the chance. 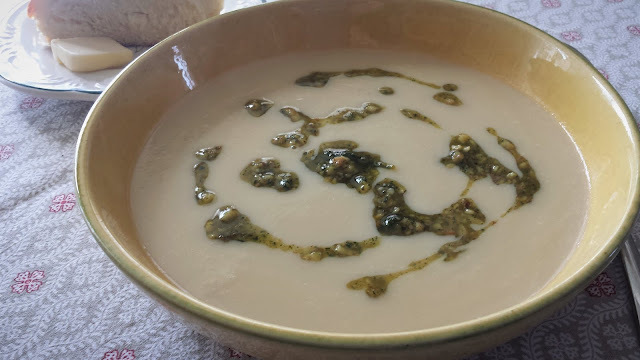 If you have never sampled a parsnip…or if you have only had the old, tired, waxed ones...the parsnip soup I am posting today would be a great starting place to experience just how delicious a parsnip can be. It is a surprise to me that parsnips aren’t more widely served on American tables. One of the unfortunate things about our national palate is that Americans gravitate towards sweet flavors…even in savory dishes. This proclivity should work in the favor of parsnips…they are quite sweet. So sweet in fact that I find they need a bit of tempering from complimentary flavors. They go beautifully with pungent turnips and rutabagas (roasted together…baked in a gratin…folded into a purée…). And they are fantastic with the slightly bitter and musty flavor of the walnut and sage garnish for this soup. The recipe for this soup is from Alice Waters’ book The Art of Simple Food II. As is almost always the case, the balance of flavors in her recipe is just about perfect. I have changed it in only one respect: Waters serves it as a chunky vegetable soup. I like to purée it (suggested as a variation in the original recipe). Parsnips purée into an incredibly velvety soup—and the drizzle of the coarse walnut-sage pesto is beautiful against the off white color of the soup. Furthermore, because parsnips aren’t the most popular vegetables on the produce aisle, sometimes the ones I have access to (even though they haven’t been waxed) have hard cores that resist cooking—even after the exterior has been completely broken down by the cooking process. Puréeing the soup…and then quickly straining it…is a great way to deal with any unyielding, fibrous bits. To get good parsnips, go to a grocery store that has a reputation for carrying local produce…or one that sells an abundant variety. Whole Foods, for example, almost always has them during the cooler months. If you have a winter farmers' market in your area, one of the growers will probably have them. As with most fresh vegetables, choose specimens that are heavy for their size (this means they will still be full of moisture) and as unblemished as possible. And, if it isn’t already clear from my comments, avoid the ones in the grocery story that have been waxed. You will be disappointed and possibly even disinclined to give them a second chance…which would be a shame. On a final technical note, when you make this soup, use the amounts of liquid given in the recipe as a guideline. As with all puréed soups, err on the side of too little liquid while the soup is cooking (if you have too much, the soup might be too thin after puréeing). Add just enough liquid so that the vegetables are moving freely and a bit loosely in the stock/water. You can always add more (and the recipe indicates that you probably will) when you actually purée the soup. While puréeing, add just enough liquid (water or stock) to allow the soup to move freely in the blender. After you add the cream, adjust the thickness again (with water or stock). I mention all of this because it is impossible to give an exactly correct amount of liquid in a recipe. I have no way of knowing how much liquid will evaporate during the cooking process (you may cook at a higher or lower level of heat…your pot may be wider or narrower than mine…etc.). Also, we may have different ideas of what constitutes a nice texture. In my opinion, a puréed soup should be on the thin side… Sippable, with a viscosity that is just slightly thicker than heavy cream, is just about perfect. In a heavy soup pot set over medium heat, melt 3 T. of the butter. Add the shallots and cook, stirring occasionally, until soft and translucent—about 10 minutes. Add the leeks, the sprig of sage and a good pinch of salt. If the pan seems dry, add the remaining tablespoon of butter. Continue to cook until the leeks begin to collapse—about 4 to 5 minutes. Add the parsnips and cook, stirring occasionally, until the parsnips have begun to soften on the surfaces—about 5 to 7 minutes. Pour in the stock. Raise the heat, bring to a boil, then immediately reduce the heat to a simmer and cook until the parsnips are tender—about 12 to 15 minutes. While the soup cooks, heat 1 1/2 tablespoons of olive oil in a small sauté pan. Add the sage leaves and cook until they have crisped and turned translucent. Remove the pan from the heat and add the walnuts and stir to coat. Season with salt and pepper. Place the garlic in a mortar and pestle and pound until smooth. Pound in a pinch of salt. Pour in the sage and walnut mixture, along with another 2 tablespoons of oil. Pound lightly. Taste and correct the seasoning with salt. Add more olive oil to achieve a consistency that pleases you. Set aside while you purée the soup. When the parsnips are tender, remove the sage sprig. Purée the soup. If the soup is too thick to move freely in the blender, add a bit of water. Strain the soup into a clean pot; add the cream and heat through, adding more water if the soup is too thick. Taste and correct the seasoning with salt. Serve with a spoonful of the sage and walnuts drizzled and dolloped over the surface of the soup. Makes a scant 2 quarts soup.